True to its name, DK Eyewitness Travel Guide: Top 10 Provence & the Côte d'Azur covers all the region's major sights and attractions in easy-to-use "top 10" lists that help you plan the vacation that's right for you. This newly updated pocket travel guide for Provence & the Côte d'Azur will lead you straight to the best attractions these cities have to offer, from walking beautiful beaches to exploring Nice to shopping in Monaco. Find the best hotels, food, and attractions for every budget. Expert travel writers have fully revised this edition of DK Eyewitness Travel Guide: Top 10 Provence & the Côte d'Azur. + Brand-new itineraries help you plan your trip to these areas of Provence & the Côte d'Azur. + Expanded and far more comprehensive, new laminated pull-out map now includes color-coded design, public transportation maps, and street indexes to make it even easier to use. + New Top 10 lists feature off-the-beaten-track ideas, along with standbys like the top attractions, shopping, dining options, and more. + Additional maps marked with sights from the guidebook are shown on inside cover flaps, with selected street index and metro map. + New typography and fresh layout throughout. You'll still find DK's famous full-color photography and museum floor plans, along with just the right amount of coverage of history and culture. A free pull-out map is marked with sights from the guidebook and includes a street index and a metro map. The perfect pocket-size travel companion: DK Eyewitness Travel Guide: Top 10 Provence & the Côte d'Azur. 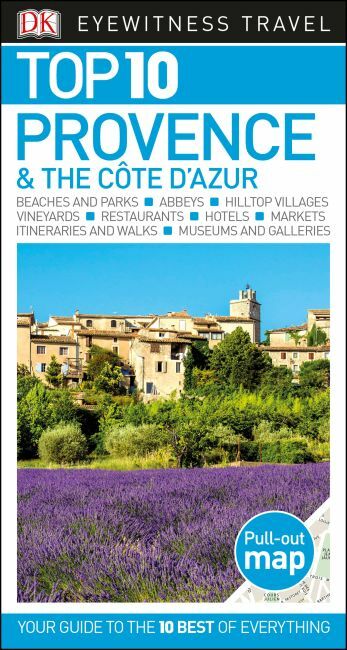 Recommended: For an in-depth guidebook to Provence and the Côte d'Azur, check out DK Eyewitness Travel Guide: Provence & the Côte d'Azur, which offers a complete overview of these cities; thousands of photographs, illustrations, and maps; and more.